Improving 3D object tracking in general. Sadly, we can not seem to get the scans and recognition to work well. We try to use ideal light environments. We have clear markers. Recommended device (Galaxy S5). The whole charade. But alas, we end up with poorly preforming recognition even for one boiler. False points in the point clouds that we can not edit. And no pointers besides the info pages help on how to improve our scans even further. Now our request is, looking at the opposition like Metaio. When does Vuforia expext that level of object recognition? when can we expect proper 3D model importing and cloud point editing in some sort of standard like 3ds Max? Are there any things we can do to improve our current state of working? Can we use other types of recognition. Can we improve scanning beyond perfect lighting and proper devices? Anything would be of great help in order to let our project(s) prosper in the future. At this point I am half considering to reverse engineer your .od files to see if i can inject edits to it to improve tracking performance. It seems to take halfhearted/blurred images as perfectly fine tracking material, which is hardly ideal. But getting edits to that file to work is a whole other can of worms, and is something i think Vuforia should be able to provide for us. Also, your [IMG] tags do not seem to work on this forum. Get on that. This is a forum feature that is not enabled. The attachment feature works fine. What information are you trying to provide in the attached files? Your scanning environment background (wood/veneer table with wood grain features) could be introducing false features. As the tool relies upon a monocular camera to scan the object, it cannot easily differentiate what is the object your scanning and what is the background. By using a background that does not introduce features (such as the 18% gray boards shown in our article Vuforia Object Scanner Users Guide), this will likely improve your scans. The provided Object Scanning Target is ideal for hand-held toys and other objects of similar size. If you proportionally increase the size of the printout such that more of your object can sit within the grid (upper right hand corner), this may improve the quality of the scan. Using an example on how to place [IMG] tags. The point i made with my attached files is that the captured images vuforia uses are often blurry. I can't imagine that lies well with computer analysys for "fixed points in space based on hard greyscale edges" Or whatever it exactly tries to get out of that image. I am suggesting to solve that in order to improve scans on the app side (less false points etc.) But maybe it doesn't matter when you take 100 images or so. 1. In case of our bigger scan we don't really have a way to cover the entire room in 18% greyscale just for the sake of a scan. I will propose this for a next scanning session but i think the probablity of turning the showroom into a photoshoot room is appealing. I get that this causes inaccurate scanning points though. 2. We have a bigger version for our bigger scans, we got that idea from the guys scanning in classic cars. It works well enough. 3. We know it isn't aligned due to the object being scanned not being able to align well. We actually just alligned it on 1 axis on our actual scans. This example scan i did to post here, and to figure out how to handle rotation/positioning relative to that center point in the grey square. We figured that as long as we had the measurements/offset we could deal with that in Unity anyway. Another complaint came in about the current scans being hard to catch on. 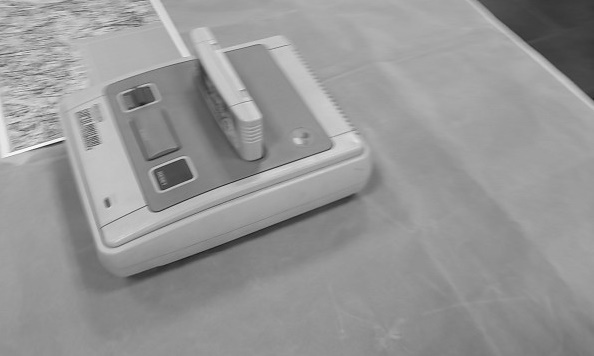 You can get something recognized now, but recognizing something like the cardridge on this SNES for example, isn't possible. It simply doesn't grasp that it is zoomed in on an existing target. Youc an do extended tracking, but Metaio somehow is able to recognize the object even when 8/9th is offscreen from the start. It somehow manages a lot more detailed points or whatever it does. We really want that kind of percision in our scans as well! Thanks for helping out so far! The file name links had unencoded paranthesis in them which was preventing correct parsing. Assuming that you have unzipped the OD file generated on device, what you have found are thumbnails of the images used to generate keypoints. These do not represent the image quality used when creating the dataset. Please also be aware that spectral reflections on object surfaces during capture can also introduce false features into your dataset. We've used diffused lighting sources to minimize this effect.